The founder of Gondar was Emperor Fasiladas who, tiring of the pattern of migration that had characterised the lifestyle of so many of his forefathers, moved his capital here in 1636 AD. By the late 1640s he had built a great castle here, which stands today in a grassy compound surrounded by other fortresses of later construction. 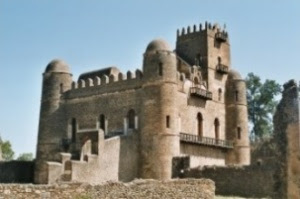 With its huge towers and looming battlemented walls, it seems like a piece of medieval Europe transposed to Ethiopia.